For serious survival preparation or a serious head start on this years garden. This survival seed vault contains over 20 non-gmo, open pollinated, non-hybrid plant varieties including Golden Bantam Sweet Corn, Black Zucchini, Crimson Watermelon, Long Standing Spinach, Winter Butternut Squash and varieties of tomatoes, carrots, broccolis and more. To feed your passion for self-reliance, all collected seeds can be re-used and re-planted, not to mention the seed vault is a hermetically-sealed waterproof container, with resealable seed packages that can be stored for 5+ years. If you've never planted a thing before, included are detailed planting, harvesting and seed-saving instructions. In (almost) everything you're cooking, fresh garlic is a must. Growing it indoors is as easy as planting one clove in a small container of soil. You will have fresh, green garlic spouting in as little as 2 days. Take one fresh organic garlic clove, unpeeled, and place in into any growing container with at least 2 inches of soil depth. Place the garlic vertically into the soil, with the bulb facing downward, until the tip is completely covered and .5cm deep from the surface. Make sure the peel on the clove is not broken; the garlic will not grow if it is. The longer you wait, the taller your garlic stalks will be. Makes a great substitute to green onions. This growing-mobile is part of the global truck farm movement; a mobile demonstration of how any small space can be used to grow your own, organic foods. The Strathcona 1890 Truck Farm, founded in Vancouver, is used to promote urban farming in the city and prove how you can effectively grow organic foods yourself - even from the back of a moving truck. The truck can be found driving around the city, stopping to talk and handout their organic Strathcona 1890 Seed Line. To be more exact, these seeds are non-GMO, open pollinated, non-chemically treated heirloom seeds that are encouraging people to eat organic as well as providing a sustainable food resources for the urban grower. More so, proceeds from their seed sales go to creating new jobs in Vancouver's east-side, as well as helping develop sustainable food growing programs at Vancouver’s inner city schools. One man's junk can be another man's treasure. 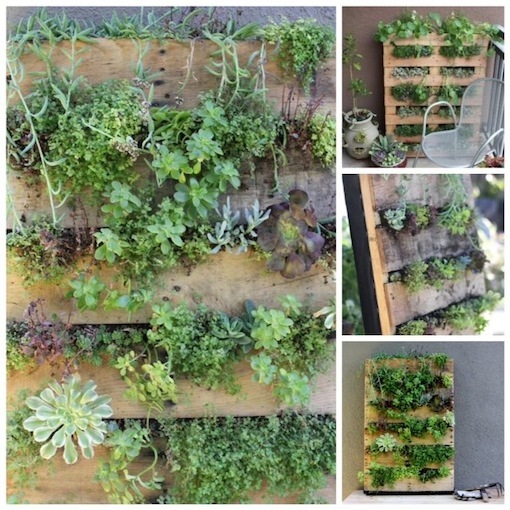 A DIY Vertical Pallet Garden is a simple way of effectively growing herbs and garden greens in or outdoors. 2. Staple landscape fabric to back, bottom and sides to hold in the soil. Vancouver has opted to be one of the 'greenest' cities by 2020, and is taking several steps in the right direction. The city will be host to North America's first VertiCrop Urban Farming System, located on a downtown rooftop parking lot at 535 Richards Street. The aim is to bring Vancouver back to a time when over 80 percent of its food was local. The fresh produce, sold under the brand 'Local Garden' will be transported directly to local markets, grocers and restaurant - significantly reducing the city's carbon footprint. Most of the growing will take place in the 4000-square-foot greenhouse area with 3000 growing trays stacked 12 layers high, all using hydroponic growing technologies. The leafy greens, herbs and fruits will be grown without the use of pesticides, herbicides or GMO's. This VertiCrop facility expects to produce 150,000 pounds of green produce annually, claiming "VertiCrop’s high-density urban farming is an effective way to grow nutritious food using fewer land and water resources than traditional field-farming methods." Ben Greene, artist and engineer, has opted to step up to the challenge of meeting the growing needs for local food by creating an integrated retailing and growing system. This 'neighbourhood urban farm' has the capacity to provide customers a complete diet ranging from fish, to mushrooms, herbs and a variety of greens, while also consistently experimenting with new and different crops. It is constructed using stacked shipping containers situated alongside a large, central greenhouse, and offers a variety of vertical growing gardens, U-pick areas and mushroom containers, all watered on a aquaponic/hydroponic system, and use lady bugs as a natural form of pest control. The organic produce is grown in hopes to sell not only to local families, but to also supply surrounding restaurants and eateries with prices that beat current organic supermarkets. The Farmery hopes to redefine the shopping experience and replace the concept of a supermarket with a 'super-greenhouse'. SOLEfood Farms is a growing enterprise within the city of Vancouver that install and manage small production farms on leased, unused city lots. SOLEfood aims to expand and help feed a section of Vancouver's downtown, giving the definition of local a whole new meaning. Currently growing at the farm: Tomatoes, Eggplants, Arugula and Kale to name a few. This concept allows the city of Vancouver to build and sustain a closer "relationship between the farmer, eater and where the food is grown." - SOLEfood Farm Locations are sprouting up in Vancouver, view the gardens next to Rogers Arena and the historic Astoria Hotel on East Hastings. More city space needs to be used like this.